excellent connections to UK’s key transport and commercial hubs, including Heathrow and Gatwick airports, London City, Southampton Port, as well as M25, and M3 motorways. 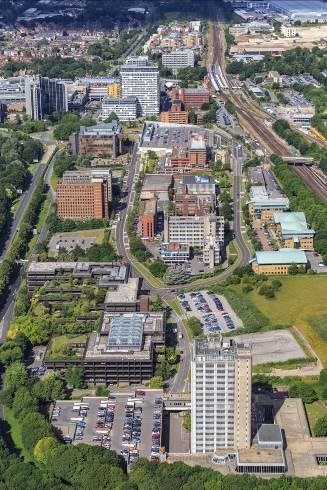 Basing View: An Innovation District for the M3 Corridor – A flourishing business ecosystem – a mix of large and small businesses working together, providing an attractive complement and ultimately an alternative to Reading and the M4 corridor. Longcross Park: Internationally Connected Premium Offer – An internationally significant business destination on the M3-M25 axis, closer to Heathrow than any other Enterprise Zone. Tech Forest Whitehill & Bordon: A New Economic Place – A key complement for the establishment of a vibrant new settlement, incorporating wider regeneration and transformative place-making, accommodating high growth SME’s from across the region. 40 hectares across three sites in The London and South Innovation Valley. Basing View is located at the heart of Basingstoke with close proximity to the train station. Quick access to the M3, via junction 6, enables a 50-minute drive to London. The quickest train to London Waterloo is 42 minutes which, alongside a 45-minute trip to Heathrow. Longcross Park site is located between Chertsey, Virginia Water and Chobham, and is nearby to J3 of the M3, and is also in close proximity to J11 and J13 of the M25. London Waterloo is only 48 minutes away by train and Reading circa 35 minutes, served (albeit currently on an irregular basis) by an on-site railway station. It is the closest Enterprise Zone to Heathrow Airport. Whitehill & Bordon based in a prime location in the South East of England. The site is uniquely positioned further South in the EM3 area, in between Portsmouth and Guildford just off the A3.